Do athletic dogs need whey protein supplements? 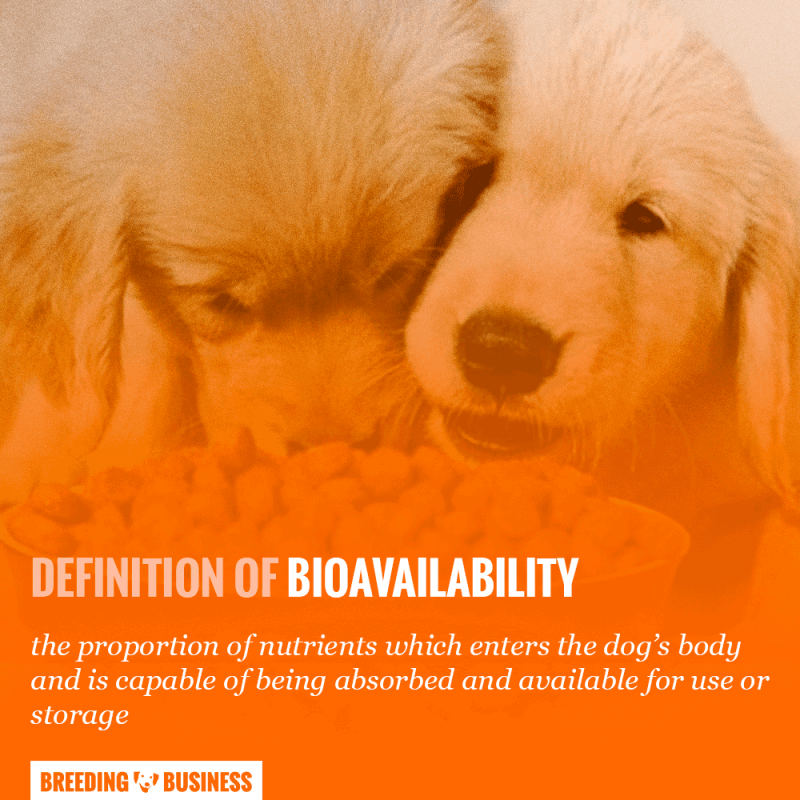 What is the bioavailability of micronutrients for dogs? Is raw feeding better for athletic dogs? Should I feed my dog once or several times a day? Should I feed my dog after exercise? What are the best carbohydrates for athletic dogs? Feeding an athletic dog is not complicated but requires careful diligence. A very active dog needs some high-performance dog food that translates into highly bioavailable proteins, essential fatty acids, and low levels of complex carbohydrates. The amount of proteins and other nutrients matters but their quality matters even more. There is no miracle diet for athletic dogs, make sure you feed your dog consistently with quality ingredients or high-performance dry dog food. Do not indulge in cheap dog foods that are packed with cheap fillers that bring nothing good nutritionally. Monitor your dog's muscle mass and body weight over time to make sure you are not overfeeding. Focusing on macronutrients such as proteins, amino acids, fats, and carbs is important, but you must also design a diet encompassing other micronutrients. These include trace elements, vitamins, and minerals. Athletics dogs are not dissimilar from human athletes who require a more demanding, nutrient-dense diet to maintain their high-performance levels. This comparison can also be made to a car which will not run without fuel — an athletic dog cannot do its job if it does that have adequate fuel! Athletic dogs may also be described as high-performance dogs. These are dogs that may work to fulfill a purpose such as participating in rescue missions and pulling sleds. They may also take part in athletics and sporting competitions to test agility or skill sets such as herding. Some dogs may do neither but instead, run or hike miles with their owners. 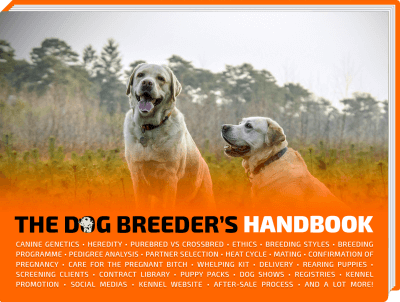 Whichever category your high-performance dog falls into, ensure he is getting adequate nutrition, or the quality of his performance and/or health may suffer. However, the feeding process is not as easy as simply filling your dog up with as much food as he or she can eat. Many athletic dogs need up to 10,000 calories per day. This is remarkable when compared with the estimated 800 calories needed by a medium-sized dog with moderate activity levels. 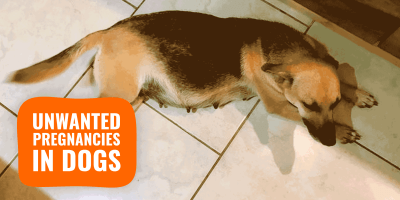 Nonetheless, it is important to consider how and from which foods your dog gets his energy. The specific nutrients required by your dog for him to be on top form will be discussed later in this passage. Special attention should be paid to the type of food given, the portion size and the intervals between meals. 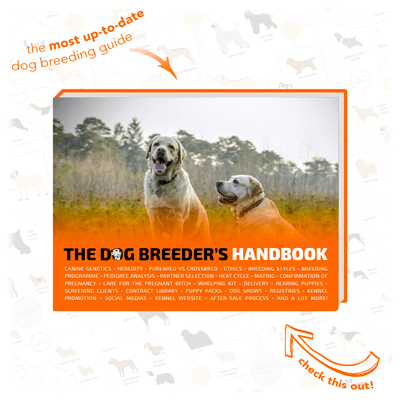 Some dogs will only have special dietary requirements during certain training seasons. For example, a sled dog who only trains in winter will not need a high-performance diet during the summer months when its energy output is less. Also, important is how long your dog is eating his nutrient dense diet before a big sporting event. It's no good only giving him a high-performance meal the day before the big event and hoping for the best. For best results, experts recommend that a dog begin a high-performance diet at least 8 weeks before a high-performance event. Below are the essential nutrients required by your athletic dog. This should be used as a rough guide only — it is important to remember that every dog has individual dietary needs dependant on an endless list of factors. Do your homework, but also pay attention to your dog's health and the quality of his performance! 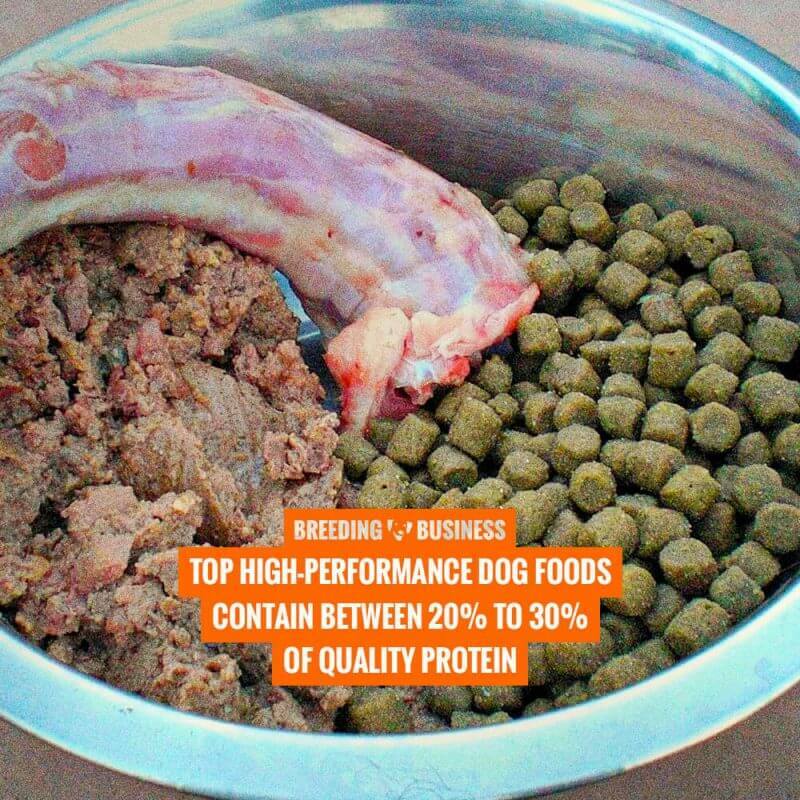 Much of the top high-performance dog food contains 20 to 30 percent protein. It is not only important that your dog eats a diet high in protein; but that the protein is high-quality. Some brands rely on vegetable protein and although the label may boast “high protein” it is likely to simply increase your dog's body fat whilst reducing his or her muscle mass. If the protein comes from meat by-products there is no guarantee that your dog will be able to efficiently digest and use it. By-products are animal parts such as feet, beaks, and tails, rather than muscle (also known as striated tissue). High-quality proteins contain amino acids needed for your high-performance dog to restore damaged tissue, build muscle and produce essential hormones. Unlike regular dogs, athletic dogs are constantly putting their muscles under stress, meaning they will constantly need to be repaired. Aside from growth and repair, protein is also used as an energy source together with carbohydrates and fats. Protein levels in various dog foods are important to maintain a healthy muscular mass. These fatty acids include omega-6 and omega-3 which your dog needs to maintain a healthy coat and skin. Some may think a thick, shiny coat of fur is only pleasing aesthetically, making a somewhat “handsome” dog. 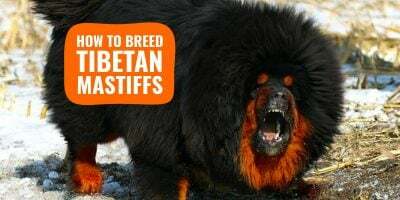 But it's crucial your dog has a healthy coat of fur to provide protection from the element, as well as from parasites it may be exposed to during high-performance activity. These fatty acids can be found in meat such as chicken and fish. Fats are also important for endurance activities lasting more than a few minutes. After a short burst of energy during which carbohydrate stores will be used up, the body turns to its fat stores to keep its energy levels going. Any increase in fat in your dog's diet should be made gradually to allow his digestive system to adjust. Before feeding your dog a high-fat diet, be honest with yourself about his or her activity levels. Feeding your dog high-fat dog food when he doesn't truly require it will just leave you with a very overweight dog. If you can get the dosage right, fatty acids such as omega-3 and omega-6 will provide added benefits for your dog such as improved cardiovascular health and strong joints. Unlike normal dogs who may do moderate exercise, high-performance dogs experience greater benefits from grains or even better, complex carbohydrates (sweet potatoes, for example). High-performance dog foods often contain finely ground grains including barley and cornmeal. Your dog's digestive system can quickly and efficiently absorb and use these for quick bursts of energy. This fast energy form is especially useful for dogs who compete in sports or activities such as sprinting that require short bursts of energy. Athletic dogs are constantly putting their muscles under intense stress, meaning they will constantly need to be repaired. Many high-performance dogs benefit from being fed little and often, as this offers more efficient digestion and balanced blood sugar levels. It is best to avoid “carbo-loading” as this can leave your dog sluggish and may cause digestive difficulties, impacting negatively on health and performance. The most important vitamins for athletic dogs are vitamins A and D as well as B-complex vitamins such as B1, B3, and B12. Vitamins do not directly provide energy, but they are essential in the process responsible for allowing a dog's body to use energy from their stores. Vitamin A and vitamin D are fat-soluble and can lead to toxicity of the liver in high quantities. It is wise to seek expert advice on the dosage which will be determined by your dog's level of activity, type of activity, breed, and size. Vitamin A helps to maintain tendons, muscles and healthy skin and fur. Dogs with vitamin A deficiency may appear weak, whilst displaying a dull skin and coat. Don't ignore the signs – your dog may be lacking this essential vitamin! Unlike dogs, humans cannot produce vitamin D in their skin, so they rely on an adequate supply from their diet. This vitamin helps to repair and maintain healthy bones, muscles, and nerves — essential for an athletic dog! B-complex vitamins (present in chicken, fish, and seeds) work alongside vitamins A to K to ensure that a dog's body functions like a well-oiled machine. B vitamins are the basic building blocks needed to ensure that basic bodily functions can be carried out. The efficiency of the tiny metabolic processes going on inside your dog will have a huge impact on how it performs on the outside, so whether your dog is raw-fed, or kibble fed — don't skip B-vitamins! Always consult an expert if you are unsure whether your dog is getting enough. Minerals are often overlooked by dog owners as they are the smaller nitty, gritty components of an athletic dog's diet. Nevertheless, if you wish to own a happy, healthy high-performance dog who can function at optimum proficiency, then minerals are a must! Sodium chloride, potassium, magnesium — these are all minerals! Minerals have multiple functions but are best known for their role in regulating fluid- balance, allowing nerves and muscles to function, producing hormones and transporting oxygen in the bloodstream. Minerals such as calcium and phosphorus also aid in the formation and protection of bone and cartilage. 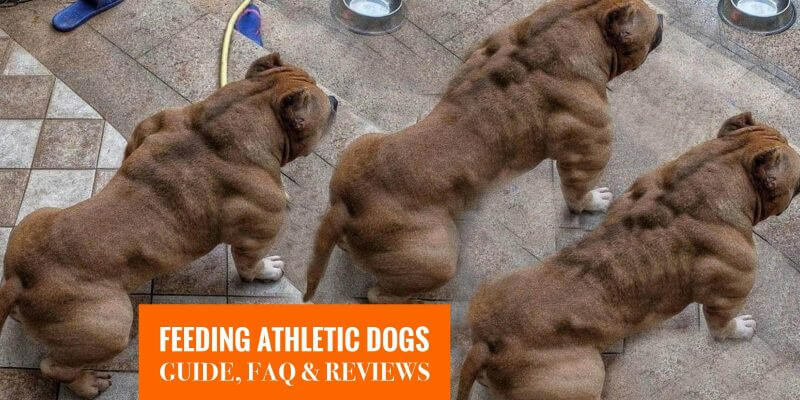 Here are the reviews of the top 7 best dog foods for muscular and athletic dogs. All dogs can use this diet but you generally want to feed that much proteins to dogs with a lean muscle mass. Weight pulling dogs are ideal candidates for such dog foods, but also agility and herding dogs. Bully Max High Performance is the only 5-star rated performance dog food, not containing corn, wheat or soy. It is also the only meat-based formula in its own class. It provides more calories than any other formula on the market; providing 535 calories per cup. Such a dense nutritional profile gives your dog all the energy and strength to deal with any training; ideal for dogs gaining lean muscle mass. Besides providing your dog with all the energy it needs with the kibble's high calories content, also supplies proteins and amino acids needed for the dog's best performance and stamina. Indeed, Bully Max performance food provides your dog 30% more protein and 20% more fat than any other product in the market; making your dog look stronger and healthier. The Bully Max High Performance Premium Dog Food is created with the best all-natural meat-based ingredients; specially created to improve your dog's performance and appearance. This Bully Max's athletic dog food is the healthier choice for all breeds and all ages, it is created for dogs from 4 weeks and older; suitable for pregnant and nursing dogs; it is easy to combine with any diet. 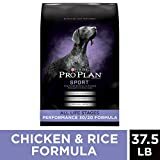 Purina Pro Plan SPORT Performance 30/20 Formula is a complete dog food with a third of protein and a fifth of healthy good fats. The best part of its content is the glucosamine that helps your dog by strengthening joints' structural performance and mobility. This great formula besides having glucosamine also contains real chicken as it first and best ingredient. More than containing simple proteins, this kibble for athletic dogs also contains various amino acids that help your dog recover and rebuild stronger muscle in the best way possible, and faster, after a good training session. Purina Pro Plan SPORT Performance dog food is for athletic and muscular dogs that exercise a lot. It is made of great ingredients: chicken, brewer's rice, fish meal (natural source of glucosamine), fish oil, dried egg, vitamin E, and so on. This quality kibble provides the healthy fats your dog needs to fuel its high and intense activity levels. This special formula increases the metabolism of your dog and gives endurance for the whole day. This formula helps optimize oxygen metabolism for increased endurance. Enhanced stamina is really important for your dog to be able to perform long training sessions on top of the regular daily activities. Wellness CORE Grain-Free Canned Dog Food is the best food for athletic and picky dogs, and yes, these dogs exist ha! Sure, it is a little bit more of an investment but you end up getting better quality as it is a wet food that is a lot tastier than dry kibble. It contains salmon, whitefish, herring, sweet potatoes and delicious greens; all this provides the great taste and flavor which identifies this product. 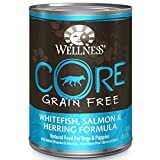 Wellness CORE Natural Grain-Free Wet is full of antioxidants, omega fatty acids, and probiotics; each bite that your dog takes of this product will provide all the nutrients and vitamins needed to become healthier for long term life. This quality canned dog food not only hopes to lengthen the life of your dog but also to improve the dog's immune system, provide your dog with healthier eyes, teeth, and gum, enhance its digestive system, and healthier skin and coat. 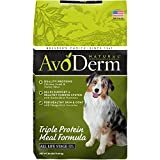 AvoDerm Natural Dog Food is a high-protein dog food ideal for very active adult dogs. It is very rich in proteins, vitamins, minerals, and antioxidants coming from quality chicken, lamb, and turkey. It also embeds avocado, apple, brown rice, flax seed, alfalfa meal, herring, and kelp meals. There are many other ingredients that provide many benefits for your dog. This great AvoDerm dog food contains as one of it mains ingredients omega-rich Californian avocados which have a boatload of great benefits ranging from a softer skin to being a natural source of vitamins and antioxidants for a healthier immune system. This kibble does not contain corn, wheat, or artificial colorings. It is a highly digestible formula perfect for preventing digestive problems in dogs. With such great ingredients, AvoDerm Natural Dog Food provides your dog all the energy and health boost to be happy and perform any activity in the most performing way possible. Avocado and avocado oil both help your dog to be protected from the inside out as it creates a great immune system reinforcement. Taste of the Wild High Protein Natural dry dog food is a highly digestible formula with superfoods and antioxidants to prevent your dog to look older before time. It contains bison, venison, lamb meal, chicken, egg, sweet potato, peas, potatoes, canola oil, tomato pomace, and ocean fish meal, amongst many other healthy goodness. All this create a unique mix that provides your dog with all the energy and stamina to perform very high-intensity trainings. This renowned kibble contains roasted bison as its first and main ingredient which provides your dog with enough proteins to develop lean, strong muscles. This formula made of real meat gives an optimal amino acid profile providing energy to recover and feel good after any training session. This all-natural dog food is complemented with fruits, vegetables, and superfood that work as natural antioxidants; providing your dog vitamins, minerals and a fatty acid blend for its skin, coat, and cognitive functions. 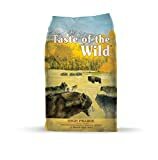 Taste of the Wild High Protein Dog Food contains trusted and sustainable ingredients from around the world and it is made of no grain, corn, wheat or any other filler; it doesn't contain artificial flavors, colors or preservatives. 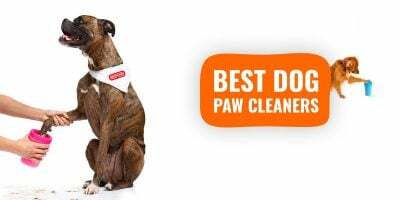 It is an all-American dog food, a family owned business, and is trusted since it is formulated with the scientifically-advanced food safety protocols. — Top Protein Powder For Dogs! 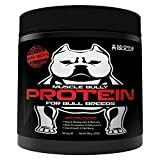 This whey protein powder by Muscle Bully is not an actual dog food but rather a great protein supplement for athletic dogs; it is easy to add to each or some meals to increase your dog's muscle building process and thus increase its best performance. You can help your dog become stronger and healthier by turning any kibble into a complete high protein dog food. Muscle Protein for Bullies is perfect to build bigger muscles and provide emphasized visual definition of dog's muscle mass. By giving this protein to your dog you are helping to create a well-balanced and athletic-looking dog with improved physical abilities. This canine protein supplement also supports your dog's skin, nails, tendons, ligaments and cartilage. Your dog will look and feel healthier from the inside after few weeks on such supplementation. There also have been some studies that show that this product helps with the prevention of cancer and tumor reductions in dogs. A protein supplementation is also perfect for growing puppies; since it provides the organs and internal support systems the nutrients they need to grow. The puppy will turn out healthier and stronger, being able to play and exercise with a lot less risk for injuries and joint problems in the future. — Healthiest Human-Grade Food For Athletic Dogs! 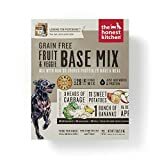 Honest Kitchen Human-Grade Dehydrated Base Mix is an amazing and super healthy dehydrated base for a dog meal. It's really easy to prepare just by adding offal or meat to it, and you will have a great balanced plate of food for your dog. It is all-natural; not containing by-products, preservative or GMO, just by adding warm water you can create a healthy and delicious food preparation for your dog. This preparation meets the FDA safety standards making it safe and appropriate for your dog's everyday diet, but also for humans since it is completely human-grade! This dehydrated base mix is a portion of really practical dog food, easy to prepare, or to give raw to your dog. Since it is grain-free, it is appropriate to be combined with other ingredients to comply with your dog's protein restriction or preferences. It is a really rich base antioxidant and allows versatility. It is made to create a unique plate of food for your dog's everyday meal; it is perfect to create a balanced meal for adult and seniors dogs, great for all breeds and sizes. Honest Kitchen Dehydrated Base Mix is all American; completely created in the USA with no China process involved in its creation. Each plate created with this amazing dog food contains sweet potatoes, peas, cabbage, organic coconut, apples, spinach, pumpkin, bananas, celery, organic kelp, and organic honey, plus vitamins and mineral premix. These additional micronutrients include tricalcium phosphate, choline chloride, zinc amino acid chelate, vitamin D3 supplement, vitamin E supplement, potassium iodide, potassium chloride, iron amino acid chelate, copper amino acid chelate, thiamine; a whole mix of richness and great ingredients to improve your dog's dietary well-being. We have also answered a few common questions we received and read about feeding very active working and service dogs. The simple answer is no. Athletic dogs do not need whey protein supplements if they are getting adequate protein from their diet. Dogs are physiologically smaller than humans so although you may rely on whey protein shakes yourself when hitting the gym hard, it doesn't mean your dog should. Because dogs are typically much smaller than humans, it is much too easy to go overboard and give them too much whey protein. This may have negative consequences for their digestive system. Experts have even suggested that the ingredients in whey protein supplements may be harmful to dogs, even in correct amounts. Whey is not a natural ingredient; therefore, dogs have not evolved to tolerate or digest it. It is also likely to make your dog's stools very smelly! If after reading this you still wish to give your dog a whey protein supplement, consult an expert to ensure that you do it in the safest way possible. Bioavailability is the amount of a substance that is absorbed into the body's systemic circulation. When discussing dogs and their meals, it is the proportion of micronutrients that are digested and absorbed by a dog's body, rather than being passed through as waste. The bioavailability of micronutrients for a dog will depend heavily on the quality of the food you feed it. Some dog foods have much more bioavailability than others — in other words, they are more digestible than others. Bioavailability is affected by many factors, for example, whether a protein is animal-based or plant-based and the temperature that the protein is cooked at. Animal-based proteins — discounting animal by-products- are usually of a higher quality because they contain more muscle and are more bioavailable. Additionally, food that is not cooked to within an inch of its life will also have higher bioavailability. This is because fewer enzymes will be destroyed during the cooking process and can, therefore, be used by your dog to aid digestion. To optimize bioavailability of micronutrients for your dog, look for foods which are dehydrated, freeze-dried, raw or frozen as these won't have been subjected to such high temperatures. It may also be favorable to switch your dog to a raw diet so that nutrients remain present in their most natural form, providing maximum bioavailability. In many ways yes, a raw diet is better for an athletic dog mainly because of its bioavailability, as mentioned above. You will also have the added benefits of knowing exactly what you are putting into your dog's body — no hidden chemicals! Many dog owners are now opting for a raw-fed diet because it brings their dog as close to nature as possible, which is generally healthier. Raw-fed diets also avoid cheap, low quality proteins (by-products) and do not run the risk of reducing bioavailability by cooking at extreme temperatures and damaging enzymes. They are more expensive than readily manufactured high-performance dog food, but the health benefits are worth the cost. Owners reported their dogs had healthier teeth, a more luxurious coat and increased energy levels — they even said their dog's stools smelt much more pleasant! 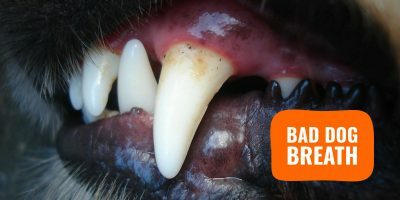 A raw-fed diet is an excellent choice for non-athletic canines too. It might require a bit more research and advice from experts to get it right, but the benefits are invaluable. Some dogs may struggle with the transition from kibble to raw food — an upset stomach being the most common issue — but this is temporary and will usually pass. All dogs are different, but usually, high-performance dogs will reap the benefits of having several smaller meals a day, rather than one huge one. Dogs are like humans in this sense; bodybuilders and athletes will usually eat 5 or 6 small meals a day rather than 2 or 3 large ones. Experts suggest eating little and often puts less stress on a dog's body and helps them recover better after intense exercise. It can also help to keep energy levels constant, helping your dog to perform optimally throughout his or her day. Nonetheless, the frequency of your dog's meals will depend on many factors such as the type and duration of the activity performed and the speed of the dog's metabolism. Again, pay attention to your dog — it may be a case of trial and error to see what suits him best. What works for some dogs, may not work for others. No, it is recommended that you do not feed your dog immediately after intense levels of activity. By doing this you are making your dog vulnerable to a bloated and/or a twisted stomach (a twisted stomach can prove life-threatening). This problem is more common in larger dogs, but smaller dogs can be affected too. It is recommended that you wait at least 30-60 minutes after you dog's intense activity has ended before attempting to feed them. Vets also warn that the same problem can arise from feeding your dog just before exercise, so the same rule applies. Keep your dog hydrated with water whilst you are waiting to feed them and try not to give in to those sad “feed me” eyes, as you don't want to have a poorly dog! The best carbohydrates for dogs are those that provide energy quickly and can be readily absorbed by your dog's digestive system. These tend to be finely ground carbohydrates including barley, corn meal and grain sorghum that your dog does not have to work as hard to digest. It is best to give your dog carbohydrates that are as nutrient-dense as possible. For example, grain sorghum is high in antioxidants, B-vitamins and minerals. Even though these carbohydrates are packed with great stuff, always pay attention to how much carbohydrate you are feeding your dog! Your dog's diet should never be higher in carbohydrate than it is in protein and fat.